Cultural Front: What if students in my literature courses become like William J. Harris? What if students in my literature courses become like William J. Harris? What if the students who enroll in my literature courses someday become like William J. Harris--lifelong supporters of the arts and humanities? That's a question I've been posing to myself lately, and I suspect that the answers I generate will lead to some necessary changes in the way that I teach my classes. 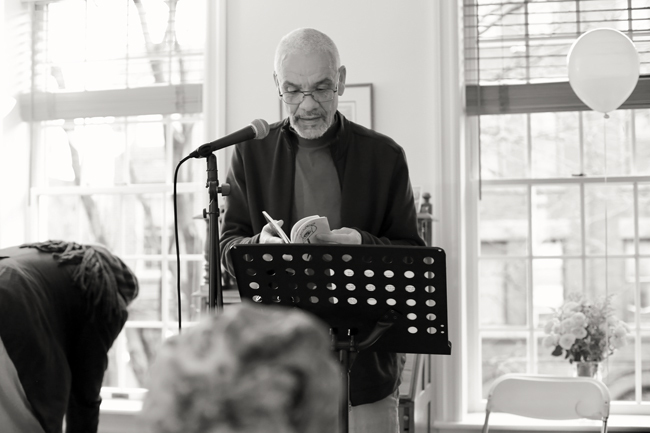 Harris, who celebrated his 75th birthday back in March by organizing a poetry reading at his home, is a recently retired literature professor. His teaching career spanned well over 40 years. He's also a poet. But just as important, he's an active observer of arts and humanities. For decades now and in the last year alone, he's attended plays and jazz concerts. He frequents bookstores. He sought out and read contemporary, thoughtful reviews and commentary on various works (volumes of poetry, biographies, essay collections, art shows, photography, films, etc) in order to identify, read, listen to, and view various other works. He's often curious and studying the ways artists evolve over the course of many years, and he's regularly thinking about how the works of new artists correspond to previous generations of artists. For decades, professors like me, it seems, have worked under an assumption in the fields of American and African American literary studies that our students might become future literature scholars. We've made that assumption even though relatively few of our students major in English or pursue graduate studies. The assumption is evident in the kinds of writing assignments and citations we require and value, and the fairly conventional types of texts that we privilege for our course reading lists. What would happen, I wonder, if I imagined that my students might someday embrace the arts and humanities in the expansive, diverse ways that Harris has? How might the shape of the class assignments change and stay the same if I assumed that the students would become decades long members of informal communities of artists and supporters of the arts? It's rarely museum exhibits, novels, and concerts in and of themselves that lead us to those productions. Instead, we encounter short writings describing the art show in the local newspaper. Or we hear convincing comments from a friend or two about why we might want to read this or that volume of poetry or biography. We hear someone say this new artist or film echoes one we enjoyed in the past. We gravitate to a particular section in the bookstore that has frequently caught our interest and see if there are things we previously overlooked. Or we are intrigued by one of the "staff picks" on the display table in the bookstore. If we think of our students as potential lifelong supporters of the arts and humanities, we might think of ways to equip them with tools to produce multiple useful responses (in the form of appraisals and recommendations to others). We could also begin an early conversation about how their patronage of the arts, in the place where they will reside, will be so vital to those communities.